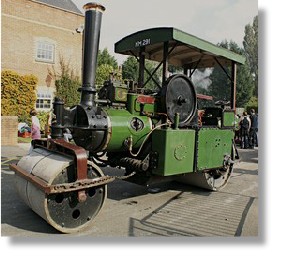 The steamroller, an E-type machine manufactured by Messrs Aveling and Porter, was acquired by the then Luton Corporation around 1922. After years of faithful service for the town it was retired to a children’s play area where for many years it amused a great number of children who would play upon it. The roller finally passed into the possession of a local railway preservation society, where it was gradually dismantled and left as a ruin. In 1997, Luton Borough Council asked the Friends of Luton Museums to take on the task of restoring it, and over the next ten years it was lovingly repaired by a group of local volunteers, led by Bernard Emerton (now sadly deceased) and Dennis Goodyear. The machine was finally brought back into steam last summer, ready for its handover by the then Chairman of the Friends, Barry Neale, to the Mayor of Luton, Councillor Lakhbir Singh, at a ceremony as part of a “Steam in the Park” event, which gave many enthusiasts from across the region the chance to get up close to working steam engines, stationary engines and tractors. Another object of admiration at the event was a 6-ton tandem steamroller, also restored to its former glory by volunteers and again with financial help from the Friends. Acquired by Luton Corporation in 1908, it was therefore celebrating its centenary in Luton. 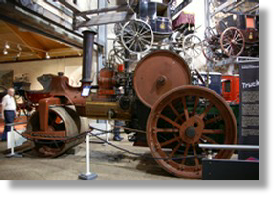 In honour of the effort and commitment shown by the volunteers in restoring the two steamrollers, the 10-ton Aveling and Porter machine has been named “Dennis”, while the 6-ton tandem machine has been named “Bernard”. 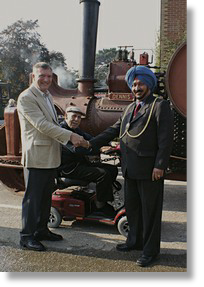 The steam roller was handed over to the Luton Cultural Trust in September 2008 at a special ceremony at Stockwood Discovery Centre. 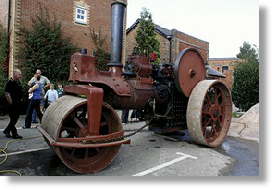 Bernard, one of only two known remaining Aveling and Porter tandem steamrollers.